Thanks sis! btw, i'm following this blog now thru GFC and FB's networked blogs. 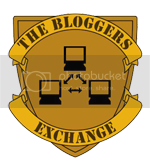 Visiting via The Bloggers Exchange! Here are some of my blogs listed. Hope you can drop by. Thanks! !